Walmart, on nearly a half TRILLION in sales earned $15.77 Billion in profit in 2012. Apple earned $41.3 Billion in profit in 2012 on $155 Billion in sales. Seems there's some stock manipulation ahead of Apple's earnings announcement later this month. Multiple sources are saying that everything from discounted iPhones at multiple retailers over the holiday to lowered amounts of parts ordering are signifying the iPhone 5 isn't selling as well. The talk has sent Apple stock south by nearly 125 points. Walmart & Best Buy, with the latter company whining to Apple, said the iPhone 5 price cut led by Walmart was unfair and that they took nearly a $100K loss EACH! Not Apple … but the retailers. Both major U.S. carriers are reporting RECORD smartphone sales this past quarter with Verizon hinting that more than ½ are iPhones. Estimates are also that 60% of the most popular gift this Christmas (tablets) - were iPads. iPad Mini stock is nearly 0 at most retailers. 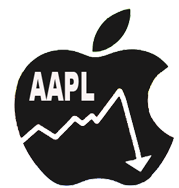 Seems some people are depending on a huge bump in AAPL come the 23rd. Apple plans to conduct a conference call to discuss financial results of its first fiscal quarter on Wednesday, January 23, 2013 at 5:00PM EST.